©Bert Gildart: In about a week I’ll be departing Montana, flying to Jackson, Ohio, to make several “slide” presentations for Rich Luhr’s Aluma Palooza, a huge international gathering of Airstream Travel trailers. When Oregon Grape appears in Montana, warm days are not far behind. One of my presentations will concern photography, and a portion of the talk will certainly include a bit about capturing images of flowers, generally a popular subject. Spring is a good time for such talks as the season is always crowned with beautiful displays, and one of those is beginning to occur right now not only in our back yard, but also in Glacier National Park. In our wooded property a particularly colorful species is growing at the base of several Douglas Fir trees. Right now Oregon Grape is putting out a dazzling florescence of yellow, and there are two ways to capture this beauty: you can use strobes (also see: strobes & mushrooms), or you can wait until natural conditions are just right and then take your picture. This morning, there was no breeze, the sun was muted by clouds reducing harsh shadows, so rather than using strobes as I often do to simulate such lighting, I set my camera on a tripod, attached a cable release so there would be absolutely no camera movement, set my f-stop to f-25 for depth of field and the shutter speed to .6 of a second. Then I depressed the cable release (no camera movement), and because there wasn’t even the hint of a breeze the slow shutter speed worked perfect. No part of the plant is blurred by movement of any kind and the depth of field reveals detail throughout. Since college, Oregon Grape has been one of my favorite plant species. In a Montana State University botany class we were required to make a plant collection of spring wild flowers and then take one from that collection and describe it in detail. 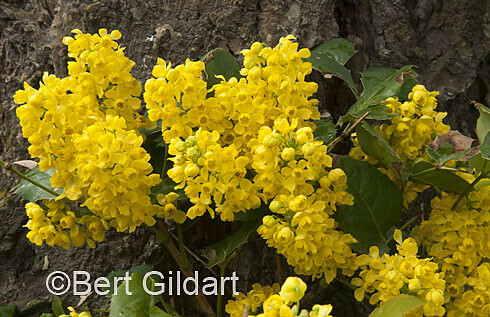 I selected Oregon Grape and my research revealed that the plant has antibiotic and anticancer properties. Scientists have discovered that the plant also contains properties effective in speeding recovery from giardia, candida, viral diarrhea, and from cholera. In the fall, grapes can be harvested and used for making a tart but very palatable grape jelly. Though I’ve never had the opportunity to try the jelly others I know have, and they say it is tasty. The species grows throughout the United States and Canada in cool, damp climates, and though not the first spring species to rear it head, is not far behind. Here in Montana, it is always a welcome sight, for it indicates that warm days are not far behind. This entry was posted on Tuesday, May 25th, 2010 at 5:31 am and is filed under Glacier National Park, Natural History/Conservation, RV Travel. You can follow any responses to this entry through the RSS 2.0 feed. You can leave a response, or trackback from your own site.